Basketball Schedule for 2017-18 Varsity, JV and Ninth Grade Lady Eagles. 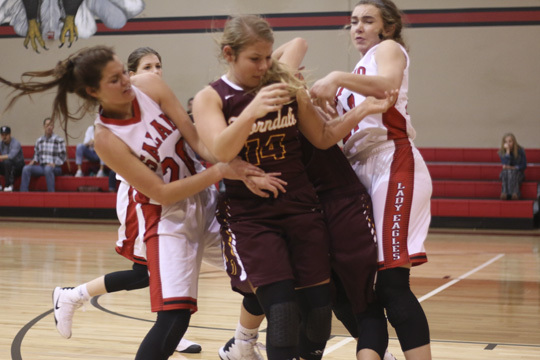 The Salado Lady Eagles have been a story of extremes in their two games so far in the Coach Smith Memorial basketball tournament. Nov. 17 Burnet Here 5:00 p.m. 5:00 p.m. 6:00 p.m. 6:00 p.m.
Dec. 1 Marble Falls There 5:00 p.m. 5:00 p.m. 6:00 p.m. 6:00 p.m.
Dec. 5 Llano Here 5:00 p.m. 5:00 p.m. 6:00 p.m. 6:00 p.m.
Dec. 12 Lampasas Home 5:00 p.m. 5:00 p.m. 6:00 p.m. 6:00 p.m.
Jan. 9 Fredericksburg There 5:00 p.m. 5:00 p.m. 6:00 p.m. 6:00 p.m.
Jan. 19 Burnet There 5:00 p.m. 5:00 p.m. 6:00 p.m. 6:00 p.m.
Jan. 26 Marble Falls Here 5:00 p.m. 5:00 p.m. 6:00 p.m. 6:00 p.m.
Feb. 2 Llano There 5:00 p.m. 5:00 p.m. 6:00 p.m. 6:00 p.m.
Feb. 9 Lampasas There 5:00 p.m. 5:00 p.m. 6:00 p.m. 6:00 p.m.
Feb. 13 Fredericksburg Here 5:00 p.m. 5:00 p.m. 6:00 p.m. 6:00 p.m.
11/08/16 Thorndale High School Tournament Thorndale High School 06:30 PM Varsity | JV: 5:15 p.m. | 9th 5:15 p.m.
11/15/16 McGregor High School Lady Bulldogs Salado High School Gym 06:30 PM Varsity | JV: 5:15 p.m. | 9th 5:15 p.m.
11/17/16 Polk-Key City Tournament Mabee Athletic Complex T.B.D. 11/18/16 Polk-Key City Tournament Mabee Athletic Complex T.B.D. 11/19/16 Polk-Key City Tournament Mabee Athletic Complex T.B.D. 11/22/16 Academy High School Lady Bumblebees Academy High School 06:30 PM Varsity | JV: 5:15 p.m. | 9th 5:15 p.m.
11/29/16 Holland High School Hornets Salado High School Gym 06:30 PM Varsity | JV: 5:15 p.m. | 9th 5:15 p.m.
12/06/16 Llano High School Lady Yellowjackets 06:30 PM Varsity | JV: 5:00 p.m. | 9th: 5:00 p.m.
12/13/16 Lampasas High School Lady Badgers 06:30 PM JV 5:00 p.m. | 9th 5:00 p.m.
12/16/16 Leander Glenn High School Lady Grizzlies 06:15 PM JV: 5:00 p.m. | 9th 7:30 p.m.
12/27/16 Thorndale High School Tournament Thorndale High School T.B.D. 12/28/16 Thorndale High School Tournament Thorndale High School T.B.D. 01/03/17 Burnet High School Lady Bulldogs Burnet High School 06:15 PM JV 5:00 p.m. | 9th: 7:30 p.m.
01/06/17 Liberty Hill High School Lady Panthers 06:15 PM JV: 5:00 p.m. | 9th: 7:30 p.m.
01/10/17 Taylor High School Lady Ducks Taylor High School 06:30 PM JV: 5:00 p.m. | 9th:7:30 p.m.
01/17/17 Llano High School Lady Yellowjackets Llano High School 07:30 PM JV 5:00 p.m. | 9th: 6:15 p.m.
01/20/17 Lampasas High School Lady Badgers 07:30 PM JV: 5:00 p.m. | 9th: 6:15 p.m.
01/24/17 Leander Glenn High School Lady Grizzlies Tom Glenn High School 07:30 PM JV: 5:00 p.m. | 9th: 6:15 p.m.
01/27/17 Burnet High School Lady Bulldogs Burnet High School 07:30 PM JV: 5:00 p.m. | 9th: 6:15 p.m.
01/31/17 Liberty Hill High School Lady Panthers Liberty Hill High School 07:30 PM JV: 5:00 p.m. | 9th: 6:15 p.m.
02/03/17 Taylor High School Lady Ducks 07:30 PM JV: 5:00 p.m. | 9th: 6:15 p.m.
Wimberley Lady Texans put an end to the Salado Lady Eagles season with a 55-36 at Leader Rouse High School Feb. 16 in the first round of the playoffs.